Rather than bombarding you with all Spey casting facts at once even though they will no doubt make total sense to you I'm going to focus these newsletter articles on each vital component of the Spey cast so you completely grasp this valuable, logical & rare advice. Today's newsletter will perfect the initial 'lifting' of your fly line which is the key to successful Spey casting if you tune into exactly what I'm saying. 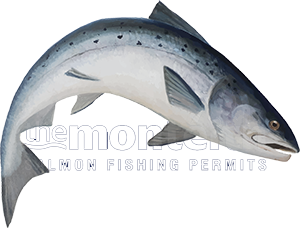 Drawing your head marker into its optimal casting position marks the start of your cast and for many salmon anglers this is exactly where things start to go wrong. If the fly line lift is not fully understood it will hinder you throughout your fishing career and you'll likely never get to the bottom of why things aren't consistently working well. The 'eagle eye' of a professional salmon guide will spot a poor and ineffectual line lift problem instantly. Ok let's begin, firstly your fly line should be straight below you in the stream and drawn back to the correct length of head for optimal casting weight & length and squeezed tight to cork handle to lock in the line energy. Your body position should be square to the target i.e. approx 45 degrees from the riverbank below you which means if your fly line is straight and parallel to the riverbank below you your upper body should be slighty turned in towards the riverbank at the beginning of the cast but not your feet which should remain facing the target area. Your hands should be low at the start of the cast and your rod tip should be at the 8 o'clock position (clock face across river) or touching the water in order to open up and maximise your line lift range. Always be aware that a salmon fly line with a sink tip will come up through the water column to the surface more effectively if it's 'smoothly & slowly' lifted and not quickly snatched to the surface of the river. Obviously 8 to 11 o'clock with smooth rising hands will massively better a 9 to 10 o'clock lift with static hands and what you've really done here is you've opened up the 'lift' range and increased the height of your rod's lifting ability by slowly & smoothly lifting your hands throughout the lift. Any sudden movements including an abrupt stop at 11 oclock will kill the cast stone dead as the rod will react with a kick which will create a pocket of slack in the fly line which represents an instant loss of line energy build up. Here's what you won't notice or normally ever look for. If the lift starts low as advised and if drawn parallel up to the 11 oclock lift finish position with smooth rising hands the split second your rod tip reaches 11 o'clock all of your fly line will be taught and arialised except for the leader and the first yard of sink tip or front end of your fly line which will be up on the surface. The importance of this cannot be over estimated and how this translates logically is that when you then go into the 'swing' section of the cast all you have is 'air resistance' and not line energy build up destroying 'water resistance' which can only be counteracted & corrected by overpowering the rod which will completely kill the cast. 'Air resistance' is negligible and 'water resistance' through an incorrect low lift is considerable. Until you see the above working you'll not realise how effortless the 'swing' then becomes following a high range optimised smooth line lift. In other words if you lift your fly line as advised you can not only build up 100% line energy retention but you will gain complete control of the swing which can then be executed with a smooth even spread energised turn of the shoulders. Incorrect lifts are why 'shooting heads' are so popular and floating versions of these are mainly used by many casting instructors throughout the UK. What's the point of learning how to Spey cast a Speyline or a shooting head with a floating version if your casting is then going to fall apart when you go into a 'real' fishing situation and have to use a fast sinking tip or sunk line and you don't know how to effectively lift it. 90% of casting errors begin with a poor lift. If you absorb the content above and compare it with how you're currently lifting your line I'll bet there's few thoughts of opening up the lift range, smoothly lifting your hands or what you should be looking for at the leader end and get a very brief glimpse of as 95% of the line arailises at the top optimal finish point of the lift. Building up line energy is what your real goal is and a nice taught smooth line from start to finish in the Spey cast is what makes it flow and look so easy. The same taught line energy build up you see when you pull on an elastic band and in a Spey cast this can be easily achieved with a range optimised, smooth rising hands lift which merges seamlessly into a smooth swing to create perfect loading for your final power stroke delivery.